3 piece Blenheim Whisky Set in a Satin Lined Presentation Box. 0.8ltr Blenheim Lead Crystal Panel Square Spirit Decanter. The elegant Gallery square spirit decanter is beautifully crafted out of 24% lead crystal and has a traditional diamond cut pattern hand cut and polished on 3 sides leaving 1 side plain for engraving. The decanter measures 250mm x 100mm. It weighs 2.1kg unboxed. The plain side has the benefit of a large engraving area that can be personalised with any crest, logo or wording to create a gift that is sure to take pride of place when put on display at home or at work. 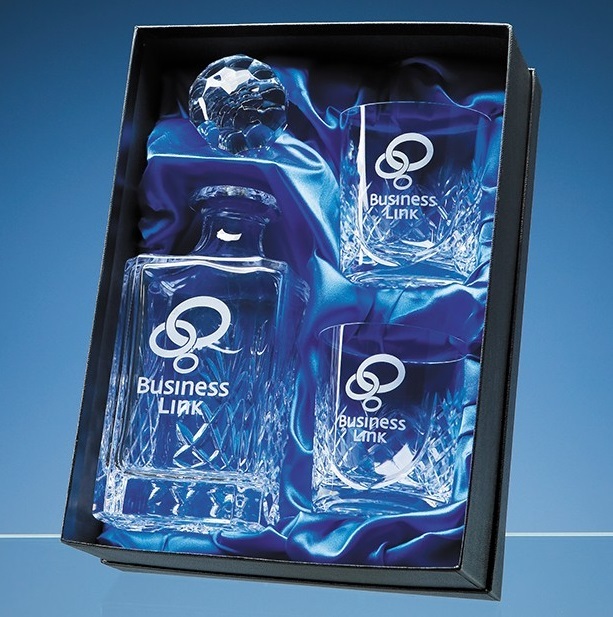 It also includes two 300ml blenheim lead crystal panel whisky tumblers measuring 95mm high x 85mm deep. All engraving has an additional charge as shown.